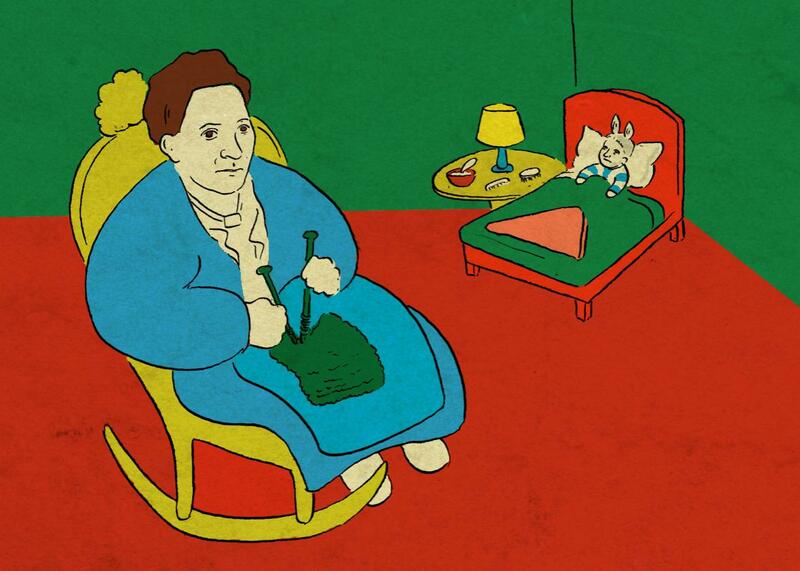 Goodnight Moon and modernism: Margaret Wise Brown’s debt to Gertrude Stein. Margaret Wise Brown, Gertrude Stein, and Goodnight Moon. This essay was originally published in Public Books. When Goodnight Moon was published in 1947, no one predicted it would become a classic. Its sales began to take off in 1953, and now the book has sold more than 14 million copies. I grew up with Goodnight Moon, and I raised my daughters on it. The text remains bearable, charming, and even compelling after many, many readings. I wanted to find out why. When my children were still little, I went from reading Goodnight Moon at night to teaching Gertrude Stein to my college students in the morning. In the midst of talking with them about Stein’s radical experiments, I was struck by how familiar they seemed. Instead of noticing Stein’s break with tradition, I noticed how much her work had in common with the books I was reading at bedtime: a love of color, joy in ordinary objects, repetition with unexpected variation. This dovetailed with another observation: My students are not as puzzled by Stein as I expect them to be. Stein writes: “Glazed Glitter. Nickel, what is nickel,” and my students recognize the moment of wondering. This habit of wonder is familiar in part because we have been raised on the lists of Goodnight Moon. That similarity is no accident: Gertrude Stein was Margaret Wise Brown’s favorite writer. Born into an affluent manufacturing family, Brown studied writing and early childhood education—conventional pursuits for a young woman awaiting marriage—but she became neither a teacher nor a wife and mother. Instead, she combined her love of modernism and education to become a pioneer in the emerging field of children’s literature. Brown and Stein’s sympathies both have their roots at Radcliffe College. Stein went to Radcliffe and studied with William James. One of her classmates there, a fellow student of James’, was Lucy Sprague Mitchell. Where Stein took James’ lessons to Paris, Mitchell took them to New York, where she applied them to the task of educating children, founding the Bank Street school of education. In 1935, Margaret Wise Brown entered the school, originally as a teacher in training, but, by 1937, she had become a writer. Born in 1910, Brown was the second of three children in a conventional, upper-middle-class family. Her nursery had a gas grate with decorative tiles depicting the three little bears and the cow jumping over the moon. The young Brown had a menagerie, including many rabbits. When one died, she skinned it, kept the fur, and announced that she was going to be a lady butcher when she grew up. Brown went to Hollins College, a women’s college in Virginia, where she discovered Proust, Woolf, and Stein. After graduation, she moved to Greenwich Village and enrolled in a fiction workshop at Columbia University. That fall, she reread Woolf and Chaucer, listened to Gertrude Stein on the radio, and went to the Brooklyn Academy of Music to hear Stein’s lectures. That 1934 lecture tour followed the success of The Autobiography of Alice B. Toklas and marked the apex of Stein’s fame. While Brown struggled in the classroom, she excelled in Lucy Sprague Mitchell’s language class. Mitchell recognized that a modern education called for new books. She also saw that she was not the person to write them. In keeping with Bank Street’s emphasis on the here and now, Mitchell wanted children to read about the sights and sounds of their own world, unadorned with fantasy. She joked, in fact, that she was introducing the “spinach school” to children’s literature. In Brown, she found the writer who could make her ideas palatable. Brown continued writing for both adults and children, but it was a children’s story that made her a paid author. When her first royalty check came, she cashed it, hailed a horse-drawn flower cart, bought every flower on it, and called her friends over for a party. By the fall of 1937, Brown was meeting regularly with Mitchell and others, forming the Bank Street Writers Laboratory. Soon thereafter, she met the painter Clement Hurd, just back from studying with Fernand Léger in Paris. On his return he and his friends had chartered a train car to Hartford, Connecticut, to see Four Saints in Three Acts, an opera by Gertrude Stein and Virgil Thompson with an all-black cast. United in admiration for Stein, and attracted to Hurd’s paintings, Brown invited him to show his work at Bank Street. Hurd watched while the children looked at his art—a process as terrifying as any studio critique. When the teacher congratulated him on holding the children’s attention for five full minutes, his career as an illustrator of children’s books began. At this time, Brown was also on staff at William Scott’s new publishing house, W.R. Scott, working to develop children’s books in keeping with the Bank Street philosophy. They invited contemporary writers, including Hemingway, Steinbeck, and Stein, to contribute manuscripts. Only Stein agreed, and the result was The World Is Round. Exciting as it was to have a reason to contact her hero, Stein’s acceptance was clouded for Brown by the fact that, although she had drafted the correspondence, the male editors signed the letters. The two women never met. Moreover, Clement Hurd’s illustrations notwithstanding, The World Is Round is not a good children’s book. More than 60 pages long, it is too dense for a child to love or a parent to read aloud. Still, there are moments when one can see why people guessed Stein might be able to pull it off. Brown wrote Goodnight Moon as a celebration of the objects in a wonderful, enormous nursery, including some features of her own childhood nursery. She asked Hurd, back from World War II and looking for work, to illustrate it. In Goodnight Moon, objects are celebrated for themselves. The book’s list is so perfect because it is so wholly from the child’s perspective. Brown gestures toward an overwhelming feeling of smallness—“Goodnight stars/Goodnight air”—even the void—“Goodnight nobody”—but ultimately offers reassurance, in the final lines that cocoon our little sleeper in “noises everywhere.” These noises, if not understood, are acknowledged. After all, misunderstood noises often keep us from sleep, and that final line seems to anticipate them, incorporating them into its lulling rhythm as if to reassure the youngest listener that the complaint she is about to make is unnecessary, that those noises are just another thing to placidly bid goodnight. In November 1950, Brown’s longtime partner, Michael Strange, died. Shortly thereafter, Brown fell in love with James Stillman “Pebbles” Rockefeller Jr., and they became engaged. She traveled to France, but fell ill. Recovering from a routine operation, she was ordered to remain in bed. Unbeknownst to anyone, a blood clot developed in her leg. Demonstrating to a friend that she felt fine, she did a can-can kick. The blood clot dislodged. She died instantly. She was 42.
that all the world was round—O. In writing for the very young, Margaret Wise Brown found the audience to delight in the imaginings of her mad poet’s heart. And through her celebrations of the poetry of color, objects, rooms, Gertrude Stein’s great imagination lives on, too.